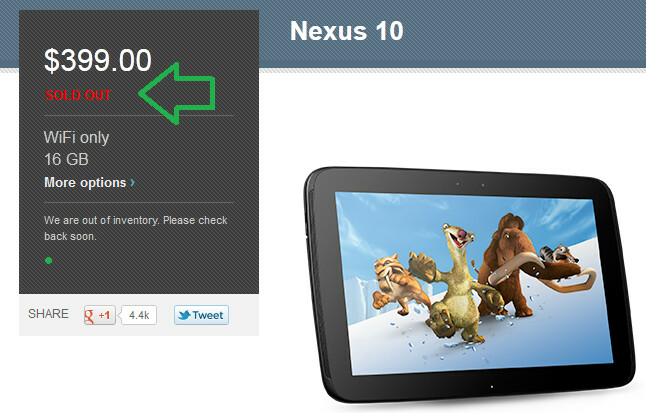 The Google Nexus 10 was back in stock at the Google Play Store on January 2nd. 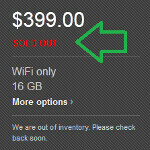 19 days later, both the 16GB and 32GB variants of the tablet are once again sold out. Both versions of the tablet, which is produced by Samsung, offer Wi-Fi connectivity only. When in stock, the price is $399 for the 16GB model and $499 for 32GB. The tablet sold out amid rumors that a new version of the Google Nexus 10 will be displayed at MWC next month in Barcelona. The GPU is expected to be updated to a 8-core T628 GPU. Those who have played with the new version of the tablet say that performance is like "night and day". Currently, the tablet features a dual-core 1.7GHz Cortex A15-based Samsung Exynos 5 chip, and a quad-core Mali-T604 GPU. Will Google look to replenish inventory of the Google Nexus 10 or will it wait for a sequel version of the tablet to be launched? That is the big question for those interested in purchasing the slate. UPDATE: The Google Nexus 10 is back in stock... for now. I want the new one heh. That's why I didn't buy any of the Nexus range, waiting for the A15 QC. Wonder why is it always sold out, low in demand of manufacturing? I thought you forgot about iPhone 2G, which didn't have 3G. iPad Mini resolution is horrible. The first iPad did not have front facing camera for skyping. So don't tell me that Apple products are perfect. I agree for the most part.. My iPad 4 is much fast than mostly any tab, maybe excluding the N10 but game wise there is no way an android tab can compete with apple tabs.. Sorry fanboys but we all know its true.. I hate apple but the only good choice would be the n10 and its made by Sammy and as a Sammy product you get an embarrassing amount of plastic.. I have heard that its comfortable to hold unlike the iPad though. I bought Ipaq 4 because of the 9.7 in. as I don't really like the 16:9 used by google. I thought it is not so bad on the software side but after using it for nearly two week, I think I will buy the Onda V972. Biggest problem with ipad is to transfer my PDF or words file as I used it when repairing or commissioning many type of machine. Using iTunes for this is not very good. Now I'm using Dropbox and Google drive to transfer file. A lot of free utility in android but not in ipad. Even to edit words and excel is not build in and need to buy. And not to mention that many time the app crash but there is no massage mention of the crash, that why people thought ipad is very stable. My wife asus Tf 101 is more stable then the ipad. What would you like to see in the next Google tablet/what do you think is missing in the current generation? Nothing is messing, Android is years ahead of IOS in terms of features and User interface anyway. I feel like nexus devices are now like "limited edition" products because nobody can get ahold of them. You and me talking about it. That's all Google ever wanted. Google's priority is software. If they are now to undercut their hardware OEM partners what becomes of Android? Look at the price for the Nexus 4 and 10, do you really see Samsung or anyone other than Google being able to compete seeing Samsung needs a profit to operate selling hardware while Google makes their cash from software? Android is also free for Google so they don't have the fees the other manufacturers have and its considered and Honor to make a Nexus device. Get one before apple throws a temper tantrum and has it banned again! I agree with most of that.. I never said I was waiting on one.. I'm saying you can barely get one not that it's bad. I do think the build quality is questionable but that's next to the Infiniti and iPad... I love the front speakers though..
VW is the worst car company ever created. Can't wait until it goes out of business like Apple. Both greedy and expensive. That is a big jeep? Don't you like BMW X5, or the RangeRovers? Yes, I will say that I wish the stock was better. I bought mine on launch day. I will also say that the one corner of the rubber strip on the back is popping up very slightly so they could've done better with build. Its not good at all!